The phrase “teamwork makes the dream work” is commonly used when talking about a group of people working on a specific goal. A video game that has a multi-player aspect is no different than many people working at a job. Video games are an acceptable escape tool for college students to feel less stressed about a test or homework assignments. For example, “League of Legends” or “Starcraft” are massive online games that require a person to compete against other teams, to conquer a problem using positive communication or to complete an objective. According to Pew Research Center, Some 17% of those ages 18 to 29 think teamwork and communication are promoted by games. As well as 47% of adults believe that playing video games help increase problem solving skills. Why do people play videogames with friends? American River College student Tashelle Miller said that she used to play video games with her brother when they were younger. Now that Miller is in college, her gaming circle has expanded. According to the American Psychological Association, more than 70 percent of gamers play with a friend. “I play with my girlfriends and my boyfriend Bryant Eckhart, and random people online. I’m not a competitive player, I just enjoy games that can hold my interest,” Miller said. A videogame is designed to complete an objective, where finishing a task is something that we as adults experience while working at a job too. This is true for college students because we as students are constantly managing responsibilities versus personal matters. While discussing these matters of teamwork ARC mathematics student Mustafa Hunt commented about what he liked about playing co-op games. “I like the cooperation amongst players,” Hunt said. Playing these types of team games help people communicate properly with colleagues in an effort to create a positive social environment to achieve an obtainable goal. A video game at its core is used as entertainment to distress from the outside world, to become captivated by the world presented to you through sound and visual arts. It is an amazing experience that many people enjoy. ARC computer science student Robert Reedy said it best about video games. “They’re just fun,” Reedy said. Miller also found enjoyment in playing video games especially with other people on campus. “People bring their systems and I ask to play, seeing them play different cool games made me want to play too,” Miller said. Miller said that her best time to play games are at ARC, when it started Spring of 2013. “When I’m at home I have no internet so I’m forced to play games with myself, but when I come at school I can play with my friends,” Miller said. 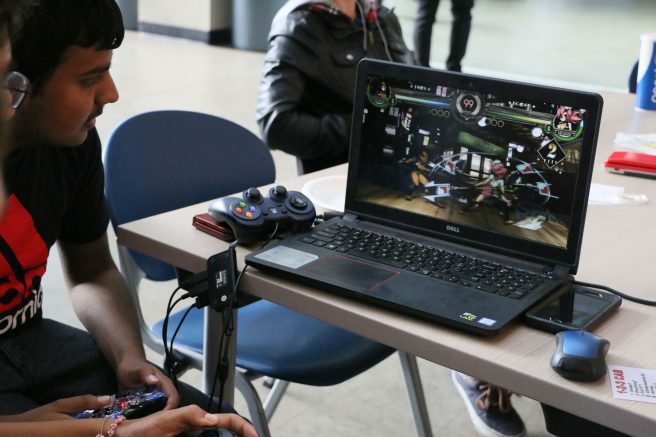 Be the first to comment on "Opinion: Videogames are building relationships at ARC"